What is the most foolish thing you’ve ever done? As I write this, I’m sitting in the lobby of Firestone, waiting as they change the oil in my car. On the lobby TV, they are showing a program about drunk people. It is the top 20 videos of drunk people acting incredibly foolish. One plastered guy they just showed was passed out in the driver’s seat of his parked car, with the keys in the ignition, the care turned on, with his foot pressing the gas pedal, with the engine redlining, and smoke pouring out of the seams of the hood! And the driver is totally asleep. The people taking the video can’t believe what they’re seeing, and they mercifully turn off the car, but probably not in time to save the driver a burned up engine. I could tell you a few more stories from the TV, show but I’m sure you get the idea. Getting drunk is foolish. There are many things that people do that are completely foolish. One of the guys from our men’s ministry created a video, part of which shows the foolish things that men sometimes do when fixing things. View it here. There are many crazy things that we humans do that deserve the label “foolish”. I know I can think of some things I’ve done. I’m sure you can think of a few of your own, a few times that maybe you deserved that label! Anyone want to share with us the most foolish thing you’ve ever done? We have a pretty clear idea what it means to be foolish. But would you ever call being a Christian, following Christ, a foolish thing? 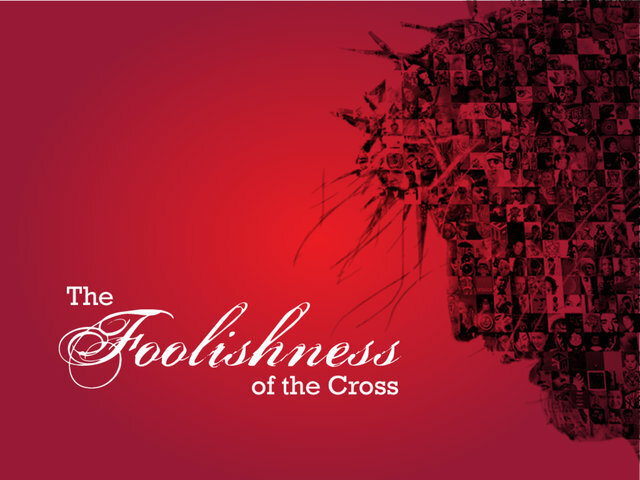 Would you say that the message of Christ is foolish? Paul says it is. In our ongoing study of 1st Corinthians, Paul has begun addressing some concerns he has with the Christians in Corinth. Last week (here and here) we saw him begin talking about divisions and unity in the church. With that theme as the larger umbrella, he addresses some foundational ideas. This week he calls following Christ a foolish thing! Do you agree with him? And why would he say that? What does that have to do with unity in Christ. Join us Sunday as we talk about being foolish. Great question! Here’s one that comes to mind and I don’t know if I ever told anyone this because I was so embarrassed. I was on my lunch break from the newspaper and just needed to get away from the office. I decided to take a drive through our fabulous city park just outside of town. There’s a circle drive through a grove of pine trees and that’s where I was headed. But I couldn’t go through because a group of men were doing some kind of road or lawn work. So I attempted to back up. On a curve. I’m terrible at backing anyway. I ended up running my car off the path in such a way that one tire was actually in the air. I got out of the car and there was no way I could fix it. So I had to approach the workers and ask for help. (The car was not visible where they were working.) Four very kind men who did not speak much English lifted the back end of my car and set it back on the road while I steered. I’m embarrassed just thinking about it. And I’m sure there are others but that’s the first one to come to mind.